Mind the mine! 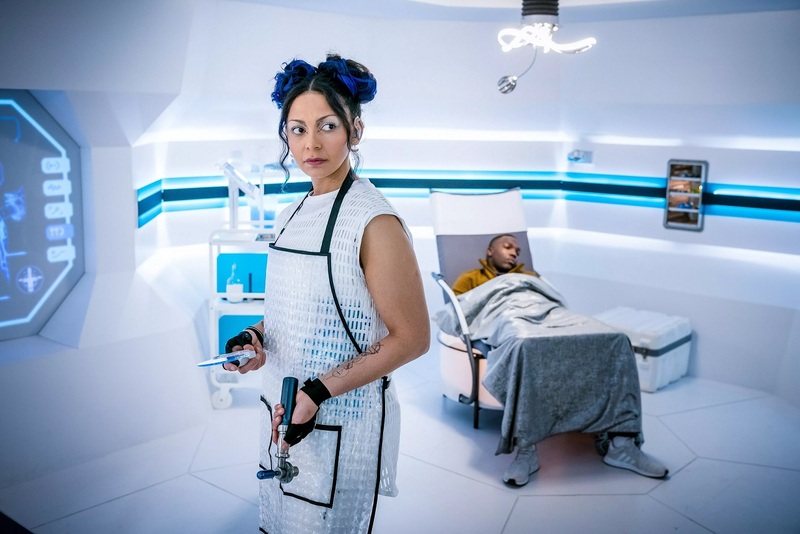 It’s advise the Thirteenth Doctor (Jodie Whittaker) should’ve heeded, but alas, she’s injured, alongside her companions, Yaz Kahn (Mandip Gill), Ryan Sinclair (Tosin Cole), and Graham O’Brien (Bradley Walsh). And they wake in unfamiliar circumstances. No, wait, they’re on a spaceship being attacked by a mysterious alien. Maybe not so unfamiliar after all. Five episodes in and I’m bored. Bored of writing how the Doctor is showing vulnerability, but the character is still developing. 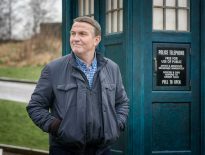 Bored of mentioning how good Bradley Walsh is and how much of the more nuanced elements concern Graham not the Doctor. Bored of waiting for Yaz to get a really good episode. Bored at the lack of clear-cut villains who get their comeuppance (Tim Shaw excepted). The Tsuranga Conundrum had good bits: the sets, direction, and much of the post-production, but for me struggled to introduce all the new characters, kill of the most interesting, and find time for some moralising. Almost all science fiction is derivative, so I will list elsewhere the many influences. What I’m not getting (it may be me) is a clear voice for Chris Chibnall’s era. Five stories in and it’s obvious a multi-part mystery like Broadchurch is a very different beast from an episodic fantasy with too much fan investment and legacy. I was more particularly unmoved by the end of the story; sleeping on it has left me less negative, but still critical. At the risk of being all about me, I miss the simpler times when I could watch the show, relax and then move on. Having to blog/ post/ tweet isn’t helping. We fans are all too serious. The standard drops (as it must over 10 episodes) and we worry the show is falling apart, spew criticism everywhere we can and spoil our own enjoyment. In the end, it was okay, but nothing more. A dreadful script, which should never have been made. It just highlights that Doctor Who only works when the script is good. If it isn’t, nothing can save it. Good actors cannot bring cardboard characters to life, nor can they stop terrible dialogue from clunking. The humour was unfunny; the zaniness was silly and irritating. It was also – and this is unforgivable – very, very boring. The series may pick up when we have some different writers. So far, it’s the worst since McCoy’s first season. There was a moment early on in this week’s episode when I thought we might be in for something special. 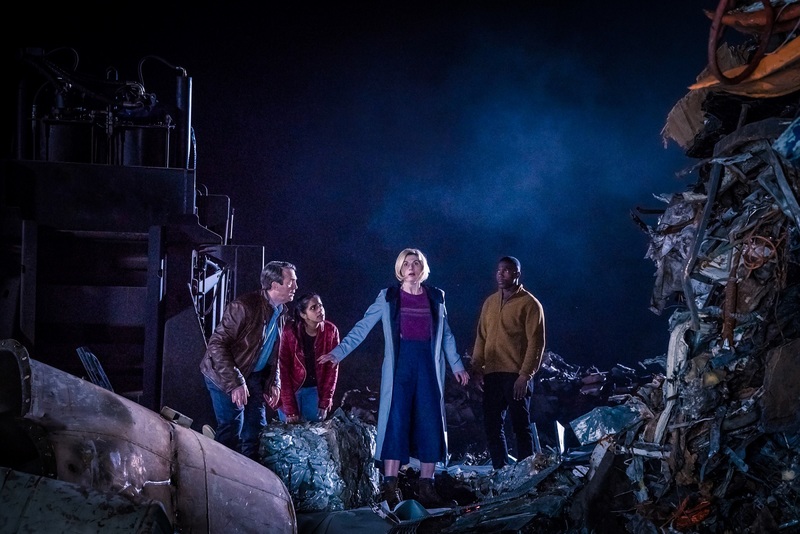 When Jodie Whittaker heard something rattling around in the ceiling of the (strangely understaffed) ship, I hoped we were about to see a story along the same lines as Midnight, that wonderful Russell T Davies chiller where the threat, never clear, takes hold of everyone on board in the most unsettling way. It was one of modern Doctor Who’s finest hours and I would quite happily have sat through a new spin on the same theme. Sadly, it wasn’t to be. Very soon afterwards, surprisingly soon as far as maintaining any tension in the story was concerned, the monster was revealed to be a kind of weird space goblin that eats everything in its path. Maybe blowing the budget on CGI for the Pting left nothing left over for some more cast members. I’m all for the move towards more straightforward storytelling in this series but I found this episode to be disappointingly thin. There’s nothing wrong with offering up the base under siege plot again but at least give us characters to care about, and situations that don’t feel lame. Male pregnancy felt like a hackneyed plotline when Star Trek: Enterprise did it nearly 20 years ago, and no doubt there were other examples before then. 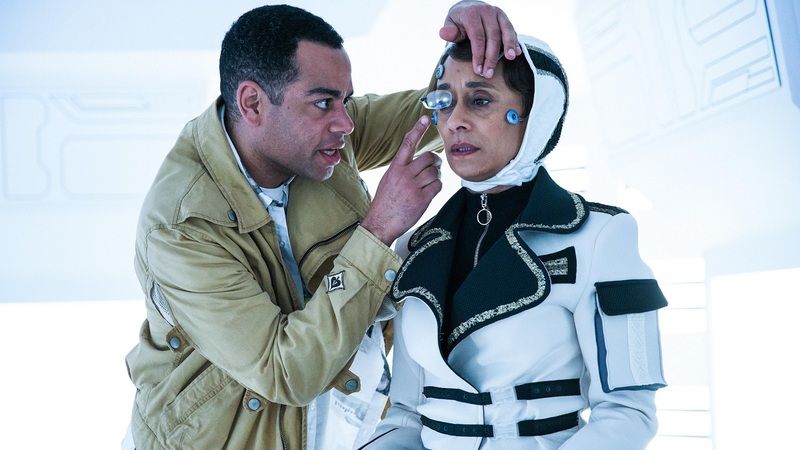 The new regular cast deserve a lot of credit for giving us characters that come across to me as rather more flawed and believable companions than we’ve had for some time, but five episodes in, I’m starting to wonder if three regulars alongside the Doctor is more than the show can comfortably accommodate. Yaz again didn’t have much to do, and Graham and Ryan were saddled with a sub-plot I’ve already complained about. I’m still supportive of what the production team are trying to do with the programme, and it’s been a welcome change to have the Doctor just travelling the galaxies for the fun of it with no Time War or ongoing thread to weigh things down, but halfway through the run I’m not getting the impression we’re going to be offered any modern classics like Midnight. I hope I’m wrong. For its first 15 minutes, The Tsuranga Conundrum is a godawful mess. The leads totter and stumble around a gleaming spacecraft trying to make sense of things, motiveless and directionless, meeting characters with no apparent pizzazz and learning snippets of information about a war that sounds about as interesting as all the food pictures that clog my Instagram feed. Meanwhile Whittaker is lurching along the ship’s many corridors (specifically, the same corridor shot six times from different angles) hacking the systems and generally behaving like the know-it-all brats you often see in Holby City who think they run the hospital. It’s not a bad thing to have a Doctor who – suddenly deprived of her TARDIS and still recovering from a life-threatening injury – is driven, maniacal, and not a little selfish, but that doesn’t necessarily make it fun to watch. It collapses in yet another damp squib of a finale, the Pting flushed into space while Graham drops in a convenient plug for Call The Midwife – but all that said, there’s nothing really wrong with any of it. The monster-of-the-week gets less screen time than Baby Avocado, but clearly that set was an expensive build and they’d already spent enough money on the spiders. What happens in Tsuranga is nothing earth-shattering or ground-breaking – but failing to set hearts alight is hardly a capital offence, and if we’re in a place where Doctor Who is only worth watching when it says something then we have officially moved into interesting times and I might have to find myself another show for my Sunday evenings. Ultimately this is innocuous, harmless filler material: a pleasant way to pass an hour, nothing more, nothing less. It seems almost churlish to complain about that. About 20 minutes in, I found myself thinking, what this episode needs is a Dalek. That would really work. That would be a surprise, that would be exciting – particularly as Chris had made us think that there would be no returning monsters this year. Instead we got Pting – the CGI lovechild of Dobby the house-elf and Beep the Meep. Half way through, and this series is just not engaging. We’ve now effectively had two base-under-siege narratives in a row. The 2018 series is aping Troughton’s second from nearly 50 years ago, but with spiders and Pting rather than Yeti and Ice Warriors. Somehow, I can’t imagine that in 50 years’ time, Pting will be as fondly remembered. The show at the moment feels like a remake of Doctor Who. It’s like watching an American remake of a British show (or vice versa); it’s competent enough – but doesn’t quite feel right. It’s missing the Who sparkle that even at its weakest used to make the show feel special. That sparkle made us fans. I think Graham’s starting to feel the same way. He’s realising he’s not in Doctor Who, he’s realising he’s in a Sunday night drama that just happens to be based on a popular BBC franchise. This week he needed to rely on skills picked up not from watching Star Wars or Battlestar Galactica, but skills from that Sunday night staple, Call the Midwife. At least it was science fiction, at least we have a non-human monster, at least there was a sort of story… yet it really did not go far. 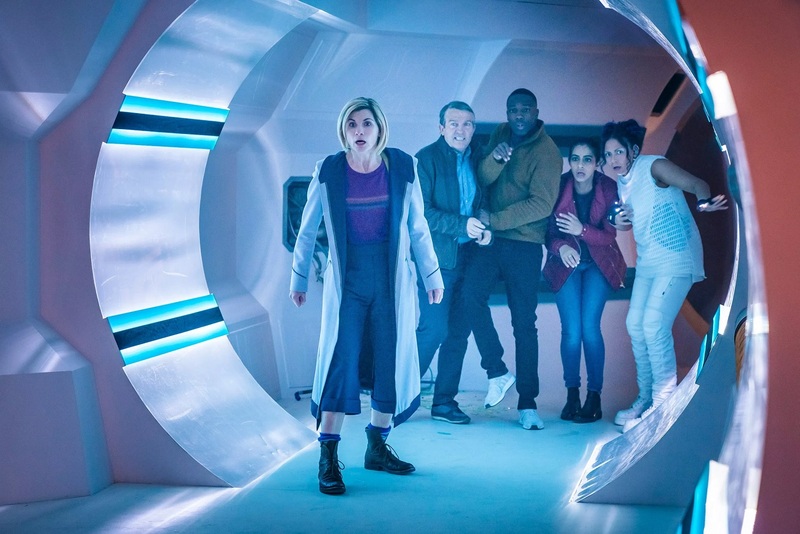 I assume the pregnant dad was to justify paying salaries to Graham and Ryan so with that sub-plot removed and the ‘senior male’ dead, we have a sort of ‘girl power’ story where the student nurse, the Doctor, Yaz, and the General get all the good roles. Yes, I know there was the brother and Android but until the end they had no real roles to play. The Pting was interesting and certainly something new but being indestructible, how come by the 67th Century they have not wiped out every power source in the universe? Or does that explain the lack of Daleks in this season? Nice touch the computer screening images of several past monsters; reminded me I was watching Doctor Who, as the story had very little to do with it by then. Overall, the ship design was nice and clean and automated, so no extras needed. The Space Station even looked a decent variation from standard Who. The scavenger planet, of course, could be any town in the UK. Seriously missed the TARDIS: so far, we have seen very little of her and very little use of her rather than being a taxi. Self-Sacrificing role at the end balanced with the birth was a nice touch. 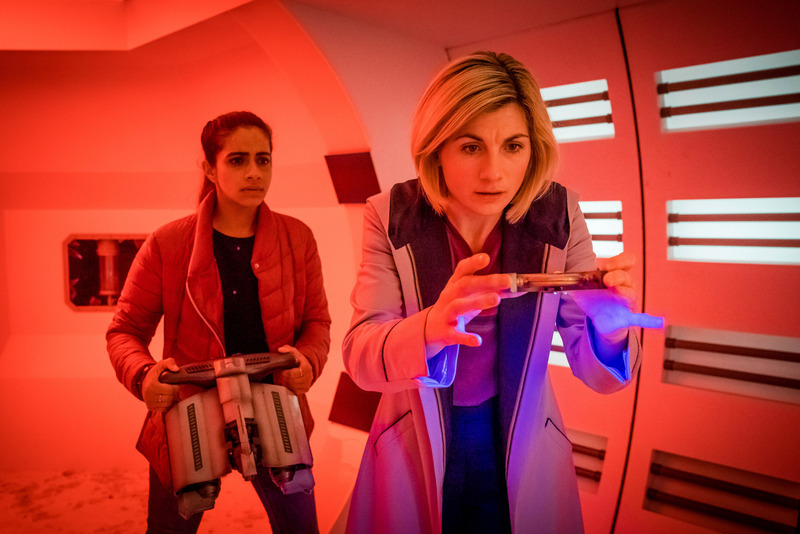 I will certainly watch it again as it was more fun that last week; however, we are half way through the season, and I have not yet had the ‘Wow!’ that defines Doctor Who. 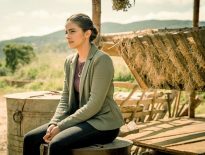 Final Verdict – episode five: Thankful it was science-fiction and probably the second best of the first half but still not really Who. I guess the set looked good. This isn’t the BOLD, NEW, EXCITING Doctor Who we were promised. It’s turning out to be generic and sometimes boring. Rosa was brilliant and gave me hope for what the new production team could do. Maybe that will be more evident in episodes not written by Chibnall. He is obviously more interested in character than plot and the growing relationships between Team TARDIS are fun, but three companions seems to be too much for 50 minutes of TV. They never have much to do; Ryan didn’t say anything for a long time this episode. Why did they give so much screen time to a character they immediately killed off at the sake of letting the regulars just stand about? The monster didn’t know it was destroying everything, which has also been done before. I would have liked it to have been slightly more vicious to juxtapose its cuteness. There was one excellent cast reaction to the monster when they all jumped back about six feet. 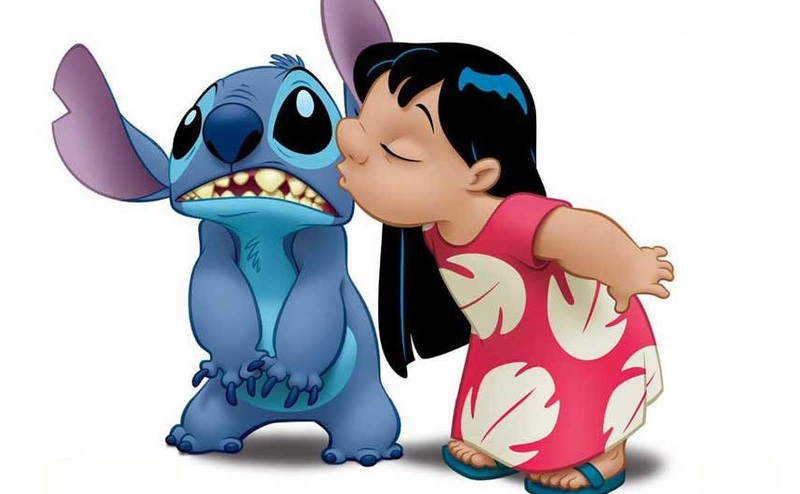 This episode wasn’t awful; it was just dull. Which to me, is worse than being bad. Ah, hello there! I see you’re interested in watching The Tsuranga Conundrum. But let me present to you a conundrum that more accurately makes a claim to that term, “conundrum.” Would you like to watch The Tsuranga Conundrum, or would you rather look at this cheese sandwich for 50 minutes…? Wait! You might think Tsuranga is immediately superior because it has Doctor Who in the title; cast those ideas aside because this isn’t Doctor Who as you or I know it. 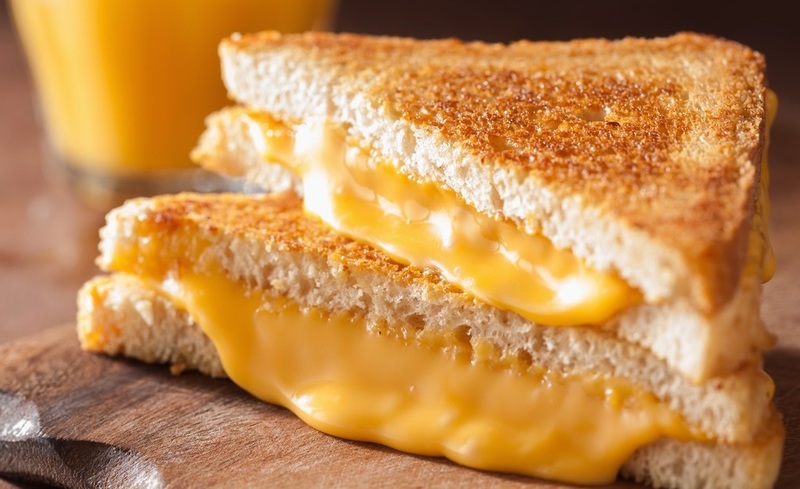 Y’see, a cheese sandwich is much more satisfying. Look at the bread. Straight away, this is a sandwich that is more deserving of your attention. The cheese sandwich also has more motivation for being: it is there to eat and to be enjoyed; whereas The Tsuranga Conundrum is there to fill 50 minutes of an evening on BBC1, presumably done at short notice (because why else would it exist as it is? ), on a budget, written by some bloke with a lack of imagination but who can certainly talk his way into a high-profile job that’ll set him up for the next 10 years. The cheese sandwich is crafted with skill and finesse, two things Doctor Who is currently lacking, in extremis. This cheese sandwich won’t bore you so much, you’ll consider washing your eyes in hydrochloric acid. It won’t preach to you about parental responsibilities. All its constituent parts are there for a reason. If you add a slice of ham to it before you eat it, this sandwich will be more surprising and fulfilling than The Tsuranga Conundrum too. But maybe you think you’re missing out on something if you decline to watch Doctor Who and opt, instead, for this yeasty treat. Don’t worry. You’ve missed absolutely nothing. Just look on Twitter. They’re going on about this stupid thing called a Pting. Look at it. Look. You’ve missed nothing. Yes, enjoy the sandwich. You have made a wise choice. Uh, so The Tsuranga Conundrum… How do we put this? It got a less-than-savoury reception from basically everyone. But next time, Chibnall relinquishes the writing reins, so we’ll see how Series 11 shapes up.